Source: Origami Treasure Chest by Keiji Kitamura. 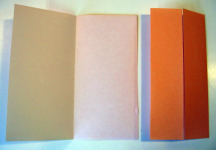 Size variations by Barbara Boxster. This display stand is a fabulous device for displaying all kinds of origami models. You can use it as a vase for flowers and leaves, for example. A neat gift idea is to mail someone some models, along with a collapsed display stand and assembly instructions. We provide separate assembly instructions that even non-folders can follow. 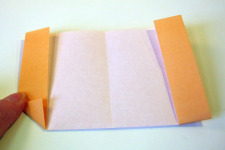 A standard 5⅞ (15 cm) piece of origami paper makes a tiny 3x1 inch stand. An 8½ inch square makes one that is 4¼x1½ inches. 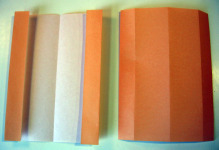 We also came up with some larger sizes with different proportions using regular 8½x11 inch paper. Instructions for 8½x11 paper vary slightly from the standard instructions and are provided below. 1. 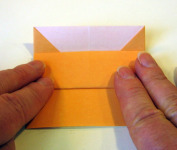 Fold the paper in half to make a center crease. 3. 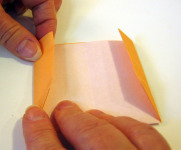 Fold in both sides to meet the center crease. 5. 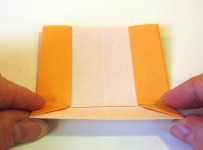 Fold in both sides to meet the creases you just made. 7. 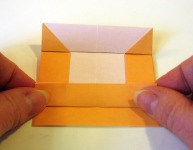 Fold the entire thing in half, by folding the lower half up to meet the top edge. 8. 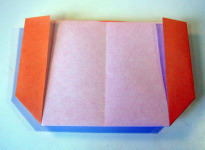 Fold the corner in, even with the cut edge of the paper (or, if you are making the placecard variation, to the crease line that is closer to the middle). 10. Repeat on the opposite corner. 11. Spin the model around to put the folded edge away from you. ...stick your finger in between the layers and slide it into the point. 13. Squash fold a little triangle. Use the helper creases you made in Step 8. 14. Repeat Steps 12 and 13 on the other side. 15. Turn the model over and spin it around to put the folded edge toward you. 16. 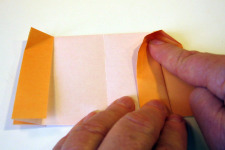 Fold both sides in using the existing crease. 17. Fold the bottom edge up, even with the bases of the little triangles. 18. Spin the model around again. 19. 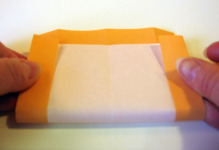 Working with the top layer, fold the bottom edge up to meet the crease you just made. 21. 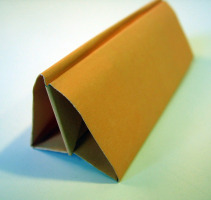 Fold the edge up to meet the crease you just made. 22. You should have these creases. 23. Turn the model over and repeat Steps 16-20 on the other side. Guess what? The folding is done. Just a bit of assembly is required. This is the stage at which you could write on it, such as a message or name for a place card. This is also the stage to which you could return it for mailing or for storage in a flattened state. Important: Before writing a message on it, make sure you know which end is up! 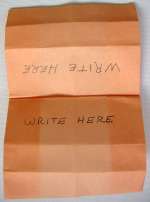 Fold back the top layer to reveal the message areas. 24. If you’re going to be sending this to someone with assembly instructions, or to help yourself do it the first time, turn the model over and label it as shown. As and Bs on one side, Cs and Ds on the other. Plus, the double-headed arrows between the pairs of creases. None of these marks will show in the end result. If you are mailing the stand to someone, print the following instructions and include them for the recipient. 2. A good tug, as indicated by the double-headed arrow, will help get it smooth and secure. 4. Set the stand on the arrows. They indicate the bottom of the stand. 5. Insert the decorative piece(s) into the slot at the top. 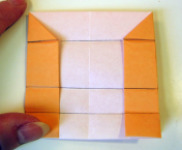 Note: If this is your first time making a stand, we recommend making one from the standard instructions using a square piece of paper before attempting these variations! This is a good size for place cards or for writing a message. Use an 8½ x 11 inch piece of paper and place it in portrait orientation. 1. 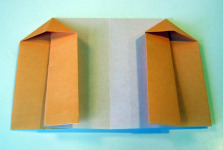 Fold in the left and right sides 1”. Do not unfold. 2. 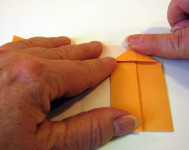 Fold in the sides 1½ inches. Unfold this step only. 3. 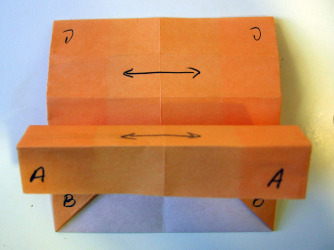 Fold the remainder the same as the standard instructions beginning at Step 6. Be sure to fold to the crease line at Step 8. 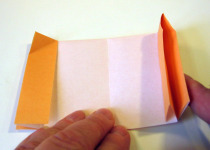 Use a 8½ x 11 inch piece of paper and place it in landscape orientation. 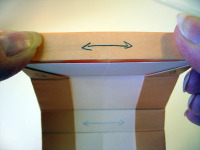 At Step 21, fold the edge up 1 inch only. 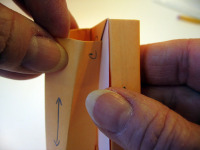 Use an 8½ x 11 inch piece of paper and place it in landscape orientation. 1. Skip Steps 1 and 2. 2. 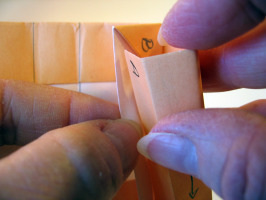 At Step 3, fold the sides in 2½ inches. 3. 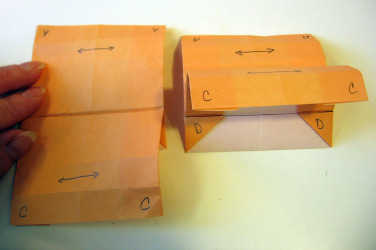 The rest is folded the same as the standard instructions.